Over the last years, we have interviewed and filmed a ton of tiny houses. Houses on wheels primarily. Some of our home tours have gotten over 1 million views on Youtube, and if you have looked on Youtube for “Tiny Houses” you will have seen some of our home tours. In this post, we have gathered the very best of the best. We hope you will enjoy it as much we enjoyed visiting all these wonderful people in their amazing tiny homes! You NEED to see this as well..
Before we start I’d like to thank each and every one of these amazing house owners and tiny house building companies who were willing to let us film their homes. We are very thankful for the opportunity to share all these great tiny spaces with our readers! We had the pleasure of filming one of the fine tiny houses from Chattanooga last winter. They do a really good job and they are also very popular. The houses are built kinda like a 5th wheeler with a gooseneck mount for a truck. And you need a good truck to two this bad boy. We also took a bunch of pictures from inside the house. Let’s start with some of the pictures. See more pictures of the Chattanooga tiny house here. We love how this house is very open, white, and just overall spacey. There are many different ways to configure the house. You can seal off the bedroom area above the toilet among other things. This tiny house is actually built and designed 30 min from where we live! We live in Denmark and last year one of our friends called us to let us know that we needed to go to “Odder” – a small village outside Aarhus (Denmark’s 2nd largest city) where we live. And we were NOT disappointed when we went to see that little cute house! Man, these guys did a great job with the design and floorplan of this house. It’s just different than what you normally see and definitely has that Northern/Scandinavian minimalistic and modern feel to it. Here’s a shot from the outside. The dark panels and the staircase really make this house stand out. We really like the mix of dark and light colors here. Here’s the interior design of the house. The layout is very unique and it really makes sense when you study the floor plan. There’s plenty of space upstairs and the open space in the middle is great when you need that little extra space. The space above the bathroom/toilet can be used for watching TV. Notice the dining table as well as the cute and stylish windows. Maria really enjoyed filming this Tiny house. It was really fun to actually film a Danish tiny house (As we are Danish), But it was also very different from many of the other designs we have seen so far. (in Danish, but there’s a translate button at the lower right corner). Mark from Bear’s tiny homes is another really great guy we had the pleasure of meeting last year. He showed us around in his really cool tiny house. Lot’s of great features here as well. The front porch can slide completely in under the house to make it easier to transport. The house is 24 feet (7,3 meter) long and 207 sq.ft. (19 M2). It’s a very nice house with cozy cabin-style wooden walls and surfaces. Here you really get the feeling that you are inside a nice warm cabin in the woods. A very cozy and open space that instantly inspires you to relax and take it easy. The simple metal lamp in the center of the house is a great touch as well. A very unique house and not like anything else we have seen. The wood finish is consistent throughout the house. Of course, you can tell from the pictures but the house had a really nice smell to it. You kind of felt like being in the middle of the forest. One of the very nice features of this house is how they have placed the master bedroom downstairs. So many tiny houses would have you sleep upstairs but not everybody can climb the ladder. Especially for elder people, this layout is really great. The next house we filmed a few weeks before the one above. We stayed in it for two nights to really get the feel of it and we loved every second of it! 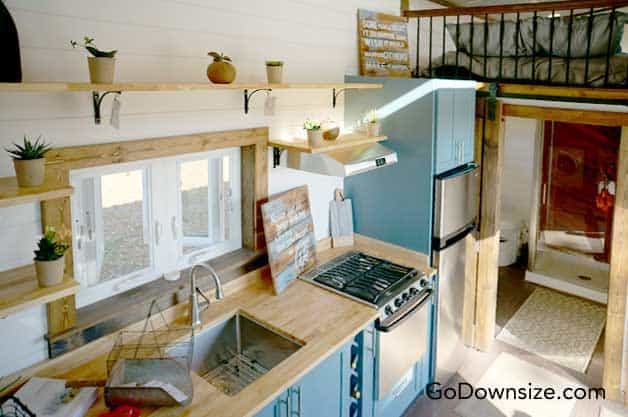 It’s a really nice layout for a super tiny house. You basically just have the kitchen and living area downstairs and then you climb the stairs and enter the sleeping loft. I LOVED sleeping in this cute little home. Being able to wake up in the middle of nature and just open the window and enjoy your little sleeping loft was a great experience. Here’s a picture of the house from the side. It has wheels below the little front porch and can be towed. This is the entrance on the left (behind the cap) where you enter directly into the kitchen/living room area. We love the white and modern feel of this house. Many American designs are more traditional and covered with darker wood and paint, which can be super-cozy as well. But for a house this tiny we typically prefer very light colors on the walls. Upstairs you have the sleeping loft which is very tiny. You can easily sleep up there but you have to bend your neck to get up there as you will see in the video below. We had a little trouble getting up there but we are also both pretty tall. 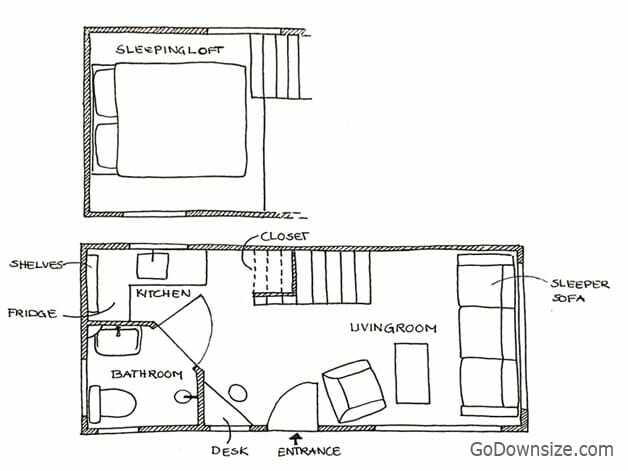 It’s one of the smallest floor plans we have seen, for a house that didn’t feel too small or claustrophobic (at all). I think another reason for this is how they have placed the windows. We got a lot of daylight into the main living area. As we said, we stayed in this tiny house for two nights and it was a great experience. We loved everything about it and we could easily live in a house like this if we didn’t have kids (luckily we have Max). And here is a drawing of the layout. We met Bob from Titan Tiny Homes in Florida last year and he was also kind enough to let us film his amazing tiny house. It’s a 28 feet (8,5 meter) model and it was brand new when we filmed it. Another really great layout and some really nice and clean white lines along the walls and ceiling. It has 256 sq.ft. (24 m2) on the ground floor and it has 150 sq.ft. (14 m2) upstairs. Here’s the kitchen area with glitter on the wall. Pretty cool. They did a really great job on mixing black and white into the space to create some masculinity and style. It also has a full burner stow and a ton of cabinet space. So storage is not going to be a problem. The loft is spacious and you have a great view over the house from here. Bob also put some nice lamps on the wall between the windows which are really cozy during night time. It has a California King mattress upstairs with a really nice sleeping arrangement. There’s also space for another TV around the bed or you can choose to have extra storage for clothes or stuff. In the video, you get an explanation of why the doors are placed on the side in the back of the house. It makes room for a much larger living area and when you add the high ceiling you get a very open and nice tiny house. It just doesn’t feel small or squeezed in any way. Great job! The second sleeping loft above the toilet can also be used for storage. So you don’t have to sell everything or do any extreme downsizing to be able to live in this space. The next one is one of our favorites. Maybe because Brett was such a great guy. We love the color of this house as well. Blue is such a great color for the exterior of a tiny house if you ask us. The little round window is a cute detail and we also fell for the big window and the Murphy bed! I can’t believe more people put a Murphy bed in their tiny house. We honestly haven’t seen it before and we have filmed a ton of these houses! Here’s a shot from the inside of the house. Very spacious and light. It didn’t really feel like a tiny house when we are sitting there. It felt more like a regular living room And I think the reason would be the amount of daylight coming into the living area through the big windows. I love how they have these huge windows to let the daylight into the living space. And here’s a little shot of the Murphy bed. But you can’t really catch this on a photo. Watch the video below instead. Brett shows the Murphy bed around the 4:50 mark. A sideways-mounted Murphy bed is a really great idea for a lot of places. Even in a loft space, you can almost always fit in a piece of furniture like this. The (downstairs) bedroom has a barn-door-style door to close it off. When the Murphy bed is down you can phone got a little writing desk. And inside the Murphy bed they have put in lighting and an electrical outlet so you can charge your phone at night. This next house is very different from the other tiny houses we have visited. It’s located centrally in the city in a garden. We filmed this cute little garden pod in The Netherlands. The owner was kind enough to show us around after we talked to the architect behind the project. It’s working as an office space but it has everything you need to live in it: A kitchen(ette), sleeping sofa, and a toilet. The house is 280 sq.ft. (26 m2) and it has some very unique features like the top window section (easiest to see in the video below) and some beautiful wooden panels outside the huge windows. Inside the house, they have built-in bookshelves all the way at one of the sides. It looks great and they have a special-made ladder that attaches to the shelving units so it’s fixed. I think this is a little too much with all the stuff but it is used as an office So the owner chose to have a lot of books and work material close by. Here’s a shot that was taken from the entrance of the house. You have the little kitchenette to the left and the door in the middle leads to the bathroom, which you can see in the video below (along with the rest of the house). The best detail is the loft windows. They are angled so the light enters most of the day (explained in the video below). This little garden pod was really a gem. Hidden in a city-garden it had everything you need to live in it full-time, even though the owner uses it as an office at the moment. The next house is another tiny house on wheels. This is also a very nice tiny house. We love the layout of this one. It’s 24 feet (7,3 meter) long. We also filmed this house last year and it’s so unique and well done that we had to include it in this post. They actually put a tub inside this house, but that was hard to catch with the camera lens so you will have to check the video below to see that. Here’s Maria sitting on the sleeping loft. Notice how natural and light everything seems. It was a pleasure being up there and it didn’t feel small at all, probably because they have given everything a light finish. Again, that’s really something we recommend people do with the tiny homes. It just makes it feel bigger! The dining area (right next to the entrance on the left) is also super spacious. You can easily sit 8 persons here when you add chairs around the table. The table can be separated into two parts and placed along the wall to the left (besides the entrance). You can see that motion in action in the video below. A REALLY neat detail that we really loved! And of course, there’s plenty of storage built-into the seats. You can lift up the seat of the bench and have a ton of stuff down there. Just as a lot of the other tiny houses this house had a full-size fridge and a four-burner stove. So you don’t have to compromise on the kitchen space and interior. For most of the houses, we have seen people really like to cook. So it’s important to have what you need to cook a good meal. We had the pleasure of filming Adam Lehman’s home-built tiny house at the Tiny House Festival north of Colorado last year. He actually built everything here himself and he did an amazing job! The house is 270 sq.ft. (25 m2) and we were impressed by how much storage and space it had. You can read more about it on this Facebook page. The tiny windows at the top is a really nice feature that adds so much atmosphere to this design! Here’s the view from the entrance and up towards the sleeping loft. The loft is super spacious because the ceiling is extra high. The contrast between the white and dark wood is great and really gives this house that extra atmosphere. The dark colors on the inside are the same color as the darker wood on the exterior. Just a cool details we didn’t notice at first. The table can fold down and make more floor space in the house. A great feature. We also love the little kitchen area and the sofa below the big window. There’s a lot of light in this house with all these windows. There are more than 13 windows as we start counting! This is a picture taken from the sleeping loft toward the entrance of the house. You should absolutely watch this video we filmed inside and outside the house last year. There is so many great details we cannot capture on a photo. We explain it all in the video. We had the pleasure of visiting Karen Jelnes in her tiny home in our hometown Aarhus. She showed us around her summer home which she built with her husband. They are both architects and as soon as you see the house you can feel the love and passion they threw into this project. It’s only 236 sq.ft. (22 m2) and they live here with their two kids during the summer period. From the outside, you can enter the house through the kitchen which is the main part of the house. The glass-doors can slide open to include the huge front porch as part of the living area. The porch is a good place to eat and be outside even when it rains. The kitchen is split into two parts: one indoor part and another outdoor part. A fun way to include the outdoor space in the daily life of a family. Here’s Karen in the indoor part of the kitchen. You can look directly out into the garden area and you really feel connected to nature when you standing here with the glass-doors aside. The outdoor part of the kitchen is made with the same wood finish as the exterior of the house. Very nice detail. There’s much more to this house but we didn’t get any good pictures from the rest of the house. So be sure to watch the video below to see how they manage to fit two children in the pretty small bedroom. This small house in San Francisco is totally its own. It was originally a laundry boiler room and now serves as a guest apartment. It has a full-size kitchen and a living room. It’s squeezed in between other buildings, and the cute factor is high! When you climb up the stairs, you first reach the mezzanine section, where you find the tiny toilet and drawers with space for clothes and belongings. It’s small, but above the entrance the architects placed a skylight, to lighten up the area. The apartment is very clean and simple – not for everyone, but for the city dwellers with a taste for simplicity it can be the perfect spot. The kitchen is big enough to actually cook, and there’s extra table space under the stairway. Here you can see how the rooms are divided. You have to like cooking if you were to live in this space full time, as it takes up most of the ground floor. The entrance door is big, and the glass sections let in a lot of light. The architect placed the upper floor on top of the brick-part, and I would personally have kept the brick-style all the way up, but it does fit in well with the surrounding buildings. Photographer: Cesar Rubio and architect: Christi Azevedo. This is a test apartment from New York City, showing some cool furniture designs. We especially love how the flatscreen slides out in front of the left side murphy bed, to transform the room for a movie night. The Murphy bed to the left might only be used as a guest bed though, because I don’t think you would sleep this close permanently in a “real apartment” space. So it could probably be replaced by a mattress. The Murphy bed couch is always a great touch, and a really good idea for a studio apartment, where you only have one room. We have written a really good article with 35 great ideas on how to get the most out of a studio apartment. If you want to see more tiny houses and tiny home tours we have a whole section on the website dedicated to this. Just click on “Tiny Homes” up in the main menu at the top of the page.